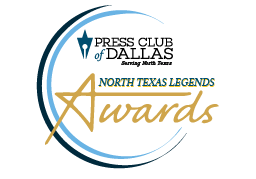 DALLAS – March 18, 2019 – Eight North Texas journalists will be recognized with the industry’s prestigious lifetime excellence award, the Legends of North Texas Journalism, from the Press Club of Dallas. Press Club members nominated candidates and a committee of three Legends (Hugh Aynesworth, Rena Pederson, and Mike Cochran) finalized the list. Gosselin began his career in his hometown of Detroit. After a few years as a journalist in New York City and Kansas City, he came to The Dallas Morning News in 1990 as a reporter covering the Dallas Cowboys, then as an NFL columnist and finally a general sports columnist. Shutze has been the city columnist for the Dallas Observer since 1998. He has been a recipient of the Association of Alternative Newsweeklies’ national award for best commentary and Lincoln University’s national Unity Award for writing on civil rights and racial issues. In 2011 he was admitted to the Texas Institute of Letters. Borta is a veteran journalist who joined CBS 11 News in 1995. Prior to that, she was an anchor and reporter at CBS affiliate WTVT-TV in Tampa, KRBK-TV in Sacramento and KCEN-TV in Waco. She has received numerous honors for her work, including regional Emmy Awards, Texas Associated Press Broadcasters Awards and the Association of Women Journalists’ Vivian J. Castleberry Award. During her years in Dallas, Ellen was an assistant managing editor at The Dallas Morning News, a founding editor of Dallas Family magazine, and chief of content at Belo Interactive. She oversees all content for Seneca Women, a global leadership platform centered on the principle that advancing women and girls will fast forward us to a more equitable and prosperous world. Previously, she has worked with Glamour, Newsweek/The Daily Beast and served as editor-in-chief of Consumer Reports magazine. Nadel is in his 25th year as the lead voice on the Texas Rangers radio broadcasts. It marks his 41st year broadcasting Rangers baseball, the longest tenure of any announcer in the history of the franchise. Nadel is a recipient of Ford C. Frick Award is presented annually for excellence in broadcasting by the National Baseball Hall of Fame and Museum. Young is Vice President of Television Programming and responsible for selecting programs and developing the KERA 13 broadcast schedule. Young has been named Programmer of the Year by the Public Television Programmer’s Association in 1994 and 1997. Prior to KERA, Young worked with NBA Entertainment, covering the Dallas Mavericks. Turner began his newspaper career in Fort Worth in 1973 and joined the Star-Telegram two years later, advancing to become vice president of advertising in 1987. Turner went on to work at Pennysaver publications in California and The Kansas City Star, before returning to the Star-Telegram in 1997. He retired in 2007. Wamre began his career in the journalism in Dallas in the 1980s as an editor for The Dallas Morning News. Today he serves as publisher of Advocate Media, a collection of upscale magazines tailored to the interests and happenings in the upscale Dallas neighborhoods of Lakewood, Lake Highlands, Preston Hollow, and Far North Dallas. Tickets are available for purchase at $30 for Press Club members and $35 for non-members. Net proceeds from the event will benefit the mission of the Press Club of Dallas, providing scholarships for students to Texas colleges and universities and supporting the operations of the Press Club. The Dallas Press Club is a tax exempt, 501(c)(3) nonprofit organization, founded in 1948 with the mission to support journalism in all its forms. The Dallas chapter produces events to support the mission of the Press Club, including raising scholarship funds for North Texas students. The Press Club of Dallas, serving five counties in Dallas, is an evolving organization of journalists, public relations practitioners, and affiliated professionals in the North Texas region, committed to promoting the fundamental tenets of communication, journalism and First Amendment freedoms. If you would like more information on how to become a member of the Press Club of Dallas, please visit: PressClubDallas.com.